Toyota has revealed two hotted-up saloons due to join its North American range soon. 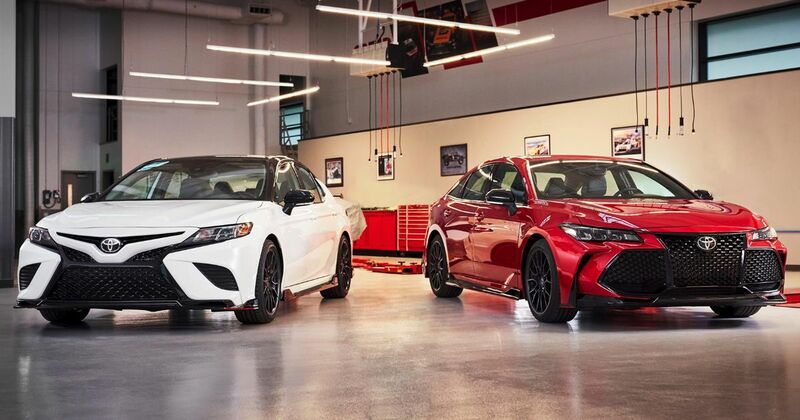 The smaller Camry and more grille-tastic Avalon have both spawned TRD versions – and they actually look pretty sweet. Both sit a little high on their US road-spec suspension, but TRD body kits add a seamless flourish around the car’s base. Red accents around the trim extensions hint at extra performance but we haven’t been told the engine details yet. There are cheeky vents, rear diffusers, extremely racy spoilers and red TRD badges, and the TRD-etched exhaust tips are just lovely. Red brake calipers behind stunning new TRD wheels look like the standard items at the back, but they may have been upgraded at the front for all we can see. On the inside the interiors have been re-trimmed in black with red accents. Sports seats should grip drivers and front passengers a little more firmly than standard. We’re expecting performance data later this week and we’ll bring it to you if there are upgrades.